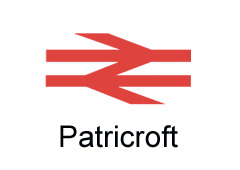 The station is located on Green Lane, Patricroft (Eccles, M30 0GX) between Liverpool Road and Monton village. The station serves communities in the neighbourhoods of Patricroft, Monton, Winton, Barton and all areas throughout the Eccles district. (External links open in a new tab or window, depending on your browser configuration). In the event of a vehicle bridge strike, or people on the track, call Network Rail on 08457 11 41 41. Visit the Network Rail website for more info.